Last week's revelation about StarCraft II's production costs wasn't exactly accurate, and journalists can't play advanced copies of the game for review purposes. Last week, it was revealed that Blizzard had dropped $100 million on StarCraft II: Wings of Liberty's development. While it was a huge figure, no one exactly seemed, well, surprised by the number. After all, this was Blizzard (which has never been known to skimp on costs) doing the development on a highly-anticipated sequel that was in development for over seven years. It turns out, though, that the number wasn't actually correct. The Wall Street Journal ran a note in its Corrections and Amplifications section revealing that StarCraft II didn't actually cost $100 million. Exactly how much was spent on the game hasn't been revealed: "Activision Blizzard Inc. hasn't disclosed development costs for its StarCraft II videogame. 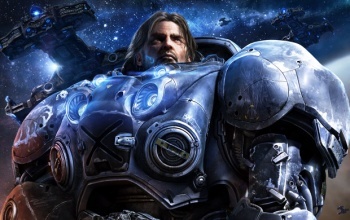 A July 16 Technology article about the StarCraft sequel incorrectly said the company spent more than $100 million to develop the game; that figure referred to its World of Warcraft game." StarCraft II is due out this Tuesday, but don't expect to see any advanced reviews before it hits store shelves. Blizzard revealed that the press won't be able to play the game before it launches, which means that journalists will be first playing StarCraft II at the same time everyone else is. "Blizzard was unable to offer an official comment at time of writing," said Eurogamer. "However, we understand from our conversations with the developer-publisher that the new Battle.net service and its online features are so integral to the game that it would be both impractical and undesirable for press to review it before servers go live." Journalists are probably upset since they're losing out on a huge amount of traffic by posting a review for the game before it launches, but would anyone really pay attention to the reviews? Players expect Blizzard to put out an excellent game and the title has sold record numbers via pre-orders. When you have a game that's this popular before it even goes on sale, advanced reviews probably seem kind of pointless from the developer's end.